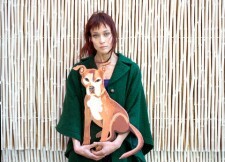 There’s been some online sniping at singer Fiona Apple because she cancelled an entire tour so that she could stay home with her dying pitbull. I doubt there would be the snark if it were a dying human. Frankly, the older I get the more I prefer dogs to humans — dogs aren’t the species who’ve degraded and destroyed the planet. So three cheers to Fiona! Barbra Cloned Her Dog — Twice!